Happy Mother’s Day to all the moms out there giving everything they got day in and day out to give their kids the best life possible! A Mothers love shapes cultures and individuals. While most mothers know that their love and emotional availability are vital to their children’s well-being, many of us do not understand the profound and long-lasting impact we have in developing our young children’s brains, teaching them first lessons of love, shaping their consciences … At a time when society urges women to seek their worth and personal fulfillment in things that take them away from their families and intimate bonds. A lot of modern moms like to blog. Millions of them actually. It is an accessible way of experiencing an often feminine need to externally process life experiences. Whether planning a birthday party, potty training, relationship advice, or career advice, it’s all there somewhere written in a mom’s blog. Whether working in the home or out, what many moms are seeking is the prudence necessary for the trials of family life thrown at them every day. Prudence is sound judgement; it is knowledge of the truth. It’s the ability to know what is best to do at all times. It is not only the right application of wisdom but of all the virtues. It is concerned with the everyday realities of living. It’s not a removed, ivory tower truth. Prudence’s concerns are a mother’s concerns. Many prudent mothers have life-saving blogs. Their applied wisdom gives peace to so many others. What is worth worrying about and what isn’t? What is worth sharing with our friends, children, spouse and what should be kept in the silence of our hearts? There are so many unanticipated challenges that present themselves to every mother, prudence in print form is a comforting ally. With it, a prudent mother can recognize and apply a moment of mercy, of love, of discipline, of words, or of silence in the right moment. The Catechism says, “With the help of this virtue [of prudence] we apply moral principles to particular cases without error and overcome doubts about the good to achieve and the evil to avoid”. Reading a prudent mother’s blog is a great practice. Striving to cultivate prudence within our own hearts? Perfect. “It’s not FAIR!” How many times a mother has to hear this phrase over the course of a lifetime seems limitless. Most of the time the children are the ones who are being unfair. It is a normal experience for little kids because they haven’t had the time and the practice to develop a strong understanding of the virtue of justice. Justice is the ability to choose the fair and kind decision for everyone involved. It enables one to give to God and to each person what is due. It enables a mother to respond to the unfair tantrums of a child with the love and respect due each child of God. Without an understanding of justice, it is easy for a mother to be swept up into the arguments of a child or on the other hand, entirely ignore them. It feels like the relentless barrage of requests and whining can send anyone into an unjust moment. It feels hopeless yet the virtue of justice remains available to those who ask. Justice doesn’t ignore the petulant child. It redirects the child to a better choice. Justice doesn’t whine and fight along. It is firm, respectful, and intelligent. The great thing about kids is that they learn by watching and imitating those around them. A just mother may have to wait a few years to see any fruits of her labor but in time her children will be just souls also. Children are often like parrots: they mimic everything and everyone around them. It’s one of the reasons as parents we try so hard to monitor a child’s TV intake and set up speech guidelines. What is interesting is that despite our best intentions, we are not always aware of what we are or are not modeling to our children. It often shocks us when we hear our children, seemingly out of the nowhere, act in a cringe-worthy way. What we need to have the strength to realize is that we are not perfect, and our children are reflecting some of those imperfections back to us like a mirror. It makes sense that even as adults, we are not finished developing the sound virtues or actions that we hope to instill in our children, yet many of us lack the strength to admit our own flaws. We lack fortitude. Fortitude is strength. It is the ability to endure difficulties and pain for the sake of what is good. For a mother, it is the ability to admit our own imperfections, no matter how small or how big they seem, and use that as an opportunity to form ourselves into something more. It is the strength to be real. It’s easy to talk about the obvious difficulties of parenthood, but the challenge of self-formation is a bit more subtle. Think of how many books are out there to give parents an edge to raise their children as emotionally intelligent, satisfied human beings. Why not start with what is most relevant? The kind of stuff that mommy is dealing with right now in her own life is the most powerful lesson a kid can ever learn because they are already experiencing it. This doesn’t mean that a mom should pour herself and the kids a cup of coffee or wine and share all the gritty details of her interior life. It does mean that if she recognizes that her own unfinished character is directly affecting her children, she stops ignoring it, and in applicable moments invites a teaching moment with her kids. Fortitude enables a mother to see her own imperfections without feeling overly embarrassed or afraid. She can endure that she is not perfect and use it as an opportunity to switch course. Fortitude allows a mother to use every opportunity to pursue the good even when she isn’t having a good moment. It’s normal to compare. It’s a human way that people gauge their successes and failures. It’s a way that we understand what is possible, beautiful, and fun, but some moms take this everyday practice to an unhealthy extreme. For them, comparison becomes a way to feed an unhealthy desire rather than a healthy tool. Comparison becomes a way to humiliate or gossip. Comparison becomes a way to feel superior. Comparison becomes a form of intemperance. Temperance is balance. It is the self-discipline to manage all possessions, desires, dreams, and goals such that each has their rightful place in the larger framework of life. 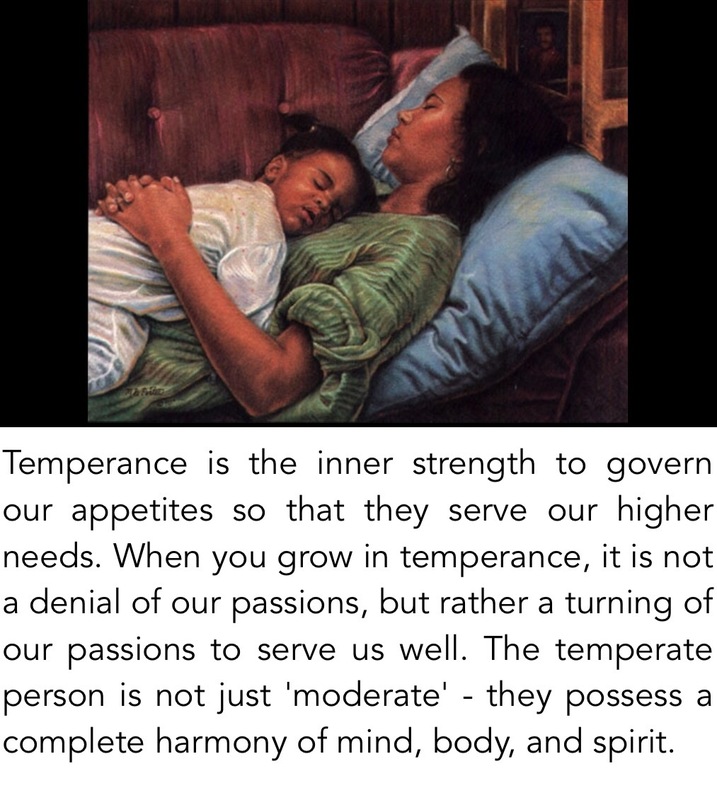 Temperance is a necessary moderation. For a mother it is the necessary moderation of the natural desire to compare. An intemperate mother can transform her role into an extreme competition and a desire for envy from others. It slowly transforms from taking care of the particular family to how the mother is perceived by others as a successful mother. An example: Little Jimmy may not actually want the cupcakes that his mom is determined to make from scratch and send to his class at the emotional expense of everyone in the house but it doesn’t matter to her. The mom no longer cares whether Jimmy is happy or not. It’s about how others outside of the home will perceive her as a mother. A temperate mom desires to be and to be seen as a good mom but she can keep it in a healthy perspective. She can live and let live. She can take a break from the comparison and be present with her family. Temperance places comparison in it’s rightful place as a helpful tool and guide. Temperance can place all of our desires in their best place. May they continue to guide us in strong and gentle ways. but still love and shape us with motherly care and compassion. Next Next post: How can you lay down your life for a friend?